Carbon Conversations: Guidance on using the International Version of In Time for Tomorrow? the International Carbon Conversations Handbook. Guidance on using the International Version of In Time for Tomorrow? the International Carbon Conversations Handbook. In Time for Tomorrow? The International Carbon Conversations Handbook is issued under the Creative Commons Attribution-NonCommercial-ShareAlike 4.0 International License. Please respect the integrity of our original text and do not make other edits. If there are other things which for some reason you wish to change, please contact us first. Note that you may not use the material for commercial gain. Your document must also be issued under the Creative Commons Attribution-NonCommercial-ShareAlike 4.0 International License. The document must make our authorship clear and link to our website. “This work is a translation of In Time for Tomorrow? 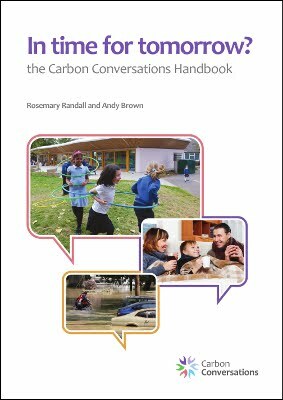 the International Carbon Conversations Handbook by Rosemary Randall and Andy Brown, published by the authors under the Creative Commons Attribution-NonCommercial-ShareAlike 4.0 International License and translated by (name of your translator) for (name of your organisation). Find more information on using Creative Commons Licenses. We are very happy to help you in any way we can with your translation and use of the International Version. Please contact us with your questions, particularly if you are unsure about whether what you wish to do is acceptable.